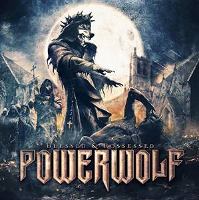 Two years after their no 1 hit album “Preachers of the Night” (at least in Germany), Powerwolf release their new album “Blessed & Possessed”. Those who know the band know what they can expect: up-tempo Heavy Metal songs with catchy melodies and choruses, organ sounds and vocals that have a little opera touch. It actually is a mixture that not everyone likes but it is unique. The unique sound in combination with the ability to write great songs is the main reason for Powerwolf's success. The ingredients for success have not changed on “Blessed & Possessed”. This naturlly means that everybody who liked the previous albums, will also like the new one, especially because there are again some great songs on the album (Dead Until Dark, We Are The Wild and All You Can Bleed, to name but a few). Compared to its predecessor, however, “Blessed & Possessed” is a bit less great (I don’t want to call it worse). There are two reasons for it: the lack of a smash hit like Sacred And Wild and the lack of a more dynamic and surprising song, just like ‘Kreuzfeuer’.